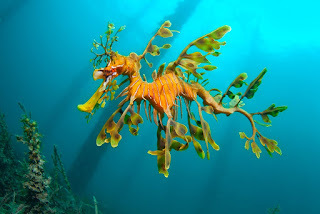 The leafy seadragon or Glauert's seadragon, Phycodurus eques, is a marine fish in the family Syngnathidae, which includes seadragons, pipefish, and seahorses. It is the only member of the genus Phycodurus. As with seahorses, the male leafy seadragon cares for the eggs. The female produces up to 250 bright pink eggs, then deposits them onto the male's tail with her ovipositor, a long tube. The eggs then attach themselves to a brood patch, which supplies them with oxygen. After 9 weeks, the eggs begin to hatch, depending on water conditions. The eggs turn a ripe purple or orange over this period, after which the male pumps his tail until the young emerge, a process which takes place over 24–48 hours. The male aids in the eggs hatching by shaking his tail, and rubbing it against seaweed and rocks. Once born, the young seadragon is completely independent, eating small zooplankton until large enough to hunt mysids. Only about 5% of the eggs survive. 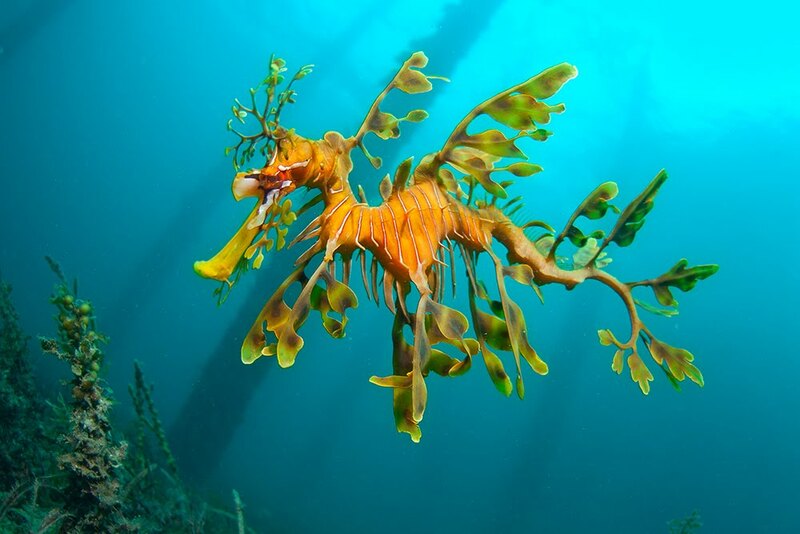 The leafy seadragon uses the fins along the side of its head to allow it to steer and turn. However, its outer skin is fairly rigid, limiting mobility. Individual leafy seadragons have been observed remaining in one location for extended periods of time (up to 68 hours), but will sometimes move for lengthy periods. The tracking of one individual indicated it moved at up to 150 m (490 ft) per hour.